I am a member of the Labour party and a supporter of virtually any member of the PLP (except John McDonnell) capable of replacing the decent but disastrous Jeremy Corbyn as leader. I joined the party in 1955, was chair of my University Labour Club, and strongly supported Tony Blair but opposed his Iraq and civil liberties failures from the start. Calling me a Blairite is completely meaningless now, but I don’t mind it if it makes a Corbynite feel better. 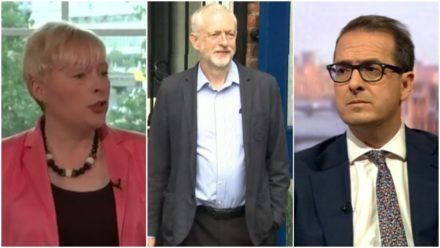 I very much hope that what is misleadingly labelled as the “moderate” majority of the PLP can be persuaded not to put pressure on either Angela Eagle or Owen Smith to stand down later today. The election is by AV, which means that party members who want Jeremy Corbyn replaced as party leader can safely vote either “1. Eagle 2. Smith”, or “1. Smith 2. Eagle”, without damaging the chances of success of either of them. The PLP should let the membership choose which of them should be eliminated first when the votes are counted – so long as Corbyn doesn’t win outright on the first count as he did last year. If Corbyn does, then it won’t make the slightest difference having both Eagle and Smith on the ballot paper. It should not be the function of the PLP to prevent me from choosing between Eagle and Smith by the order in which I place my preferences. I happen to be a strong supporter of Angela Eagle, with her long experience, excellent record, robust character, growing charisma and sheer courage. I have nothing against Smith but despite my almost obsessive interest in politics I had never heard of him until last week, and it seems to me inconceivable that the ordinary voter out in the country, with no particular interest in politics, is going to vote in a general election for a party led by someone he or she had never heard of until just before polling day. Yet it seems more likely than not that the PLP’s “moderate” majority is about to press Eagle to stand down, for absolutely no reason at all. Under AV, there is no danger of two challengers “splitting the anti-Corbyn vote”: that’s first-past-the-post thinking and totally irrelevant. Since both Eagle and Smith apparently have well over the 51 members’ support required to qualify them to stand, both have an absolute right to do so: and no harm can be done by both of them being on the ballot paper. I shall most strongly object if the PLP deprives me of the opportunity to register my support for Eagle in the forthcoming leadership election. It will do no harm whatever to Smith’s chances if both he and Eagle are on the ballot paper, as they both ought to be. The PLP should not usurp the membership’s right to choose between them so long as both have crossed the PLP support threshold. I trust that enough PLP members will understand this and will drop this silly and harmful idea that there must be only one challenger to Corbyn. I understand the concept of focusing attention on a single challenger, but in this case that should be overridden by the advantage of demonstrating that there is more than one candidate well qualified to lead the party, and later the country. Reducing the number of challengers artificially to one risks losing an unquantifiable number of votes that would otherwise have gone to the candidate not on the ballot paper. How many will bother to vote if the only challenger candidate is someone almost completely unknown?